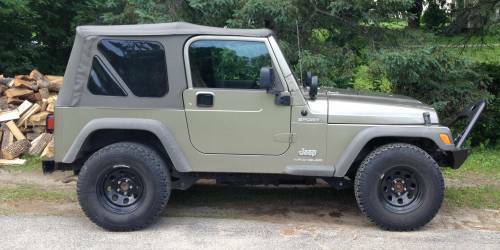 Message: i have a 2005 jeep wrangler sport with almost 63k it is my daily driver so miles will be going up everything is perfect on it. it has 31/10.5/15 bfg all terrains on new 7.5 black rims front ones are 95% back ones are 50% and have two other ones that are like 50% also have a 30/9.5/15 tire. it has a winch ready bumper. it comes with hard top soft top stock front bumper stock side steps all bumper end caps stock front tow hooks and stock spare tire carrier. it also has the better speaker system 6inch sub in the middle console sounds great. Need gone fast 15,000 obo. best way to get ahold of me is text 1(207)four.nine.one-seven6seven7 or email. This entry was posted on Monday, July 7th, 2014 at 9:20 pm	and is filed under Maine, United States. You can follow any responses to this entry through the RSS 2.0 feed. Both comments and pings are currently closed.